Using context clues is an explicitly taught reading strategy that students use to figure out the meaning of an unknown word (Flemming, 2014). When coming across an unknown word, a student uses other words in the text that are usually in the same sentence or nearby sentences that provide clues to the meaning of the unfamiliar word. These clues may include synonyms, antonyms, definitions or examples. Students can also use clues from meaningful word parts such as the base word, prefixes or suffixes. 4. Confirm or revise your prediction. Reread the sentence using your prediction. Are you satisfied with your prediction or do you need to read further back or forward in the text to see if the author provides more clues? Do you need to use a resource beyond the text? If so, try a dictionary or ask someone. Which clues did you use to help you predict the meaning of the word? How did the author help you understand new words? What synonyms or antonyms help you define new words from the selection? What examples did the author write to help readers understand new ideas? Did the author use comparisons to help describe new ideas? Remind students to reference context clue visual aides, such as posters and bookmarks with a checklist of strategies. Provide students with ample opportunities to practice this strategy using authentic texts at their independent reading level. For students who need additional practice, supplement with shorter chunks of text on task cards or worksheets. Find opportunities to continually model the strategy during read-aloud, in morning messages and in content-specific subject areas such as science or social studies. In this activity, students write down any unfamiliar words on a post-it note that they encounter while reading. 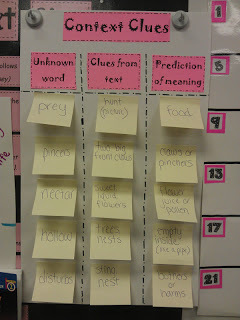 On a second post-it note, they write down clues from the text to help them define the word. Based on this information, they are able to make a prediction. Providing a visual or an anchor chart, such as the one pictured above, allows students to make references as they answer questions, expand ideas and become more familiar with using context clues to deepen their understanding of the text. Science Example - "Out of this World Context Clues"
This activity is designed to help students learn to use context clues to figure out the meaning of unfamiliar vocabulary as they learn about the different planets. After the lesson, students are able to play the role of an astronaut exploring a new planet. They encounter aliens who speak a language similar to English, but with some very different words. The "Context Clues Multiple Choice Cards" contain 4 short stories. Each story contains a nonsense-word from the "alien language." Students need to figure out (based on the context of the story) the meaning of the alien word. In this activity, students read a short passage on the Hopi Culture. They are able to use context clues to define unknown words. Students can also practice using different context clues as they read additional articles that are related to Social Studies. Jennings, J., & Lerner J & Caldwell, J. (2014). Reading problems: Assessment and teaching strategies (7th ed.). Boston: Pearson/Allyn and Bacon.